When I use this article as a talk, I start off by making some important statements. Firstly, this is an intensely personal series of choices, and like any such choices, they change frequently over time. And particularly if some new treasure turns up, having been sought out on eBay! Also, I’ve used a number of criteria in the details for each object, namely the state of the market, visual appeal and a design’s importance to the story of 20th century decorative arts. It was also important to me that all the pieces should be (largely) accessible and affordable. These shouldn’t be designs that you and I can’t afford to ever own. Maybe you even own one already! They also all date from after WWII, and I believe that they are, or should be, deemed classics of their time. So let’s start with something very familiar. 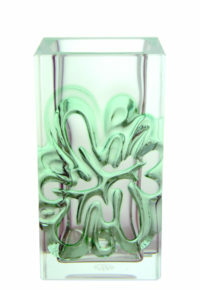 Whitefriars’ ‘Banjo’ vase (left), was designed by Geoffrey Baxter in 1966 and was a key part of their famous ‘Textured’ range released in 1967 and produced into the 1970s. I’ve chosen an example in orange, which was called ‘Tangerine’ by the company. Colour is important for two reasons. Firstly, I believe Tangerine to be the most notable colour as it just shouts out the 1960s – think of Verner Panton, or even Austin Powers. Secondly, colour is key to value – although they were produced in a range of colours, quantities produced and desirability vary widely between them. Whilst a ‘Tangerine’ example currently fetches anything from £300-600 depending on where it’s being sold, a rarer ‘Meadow Green’ example may fetch over £1,000! 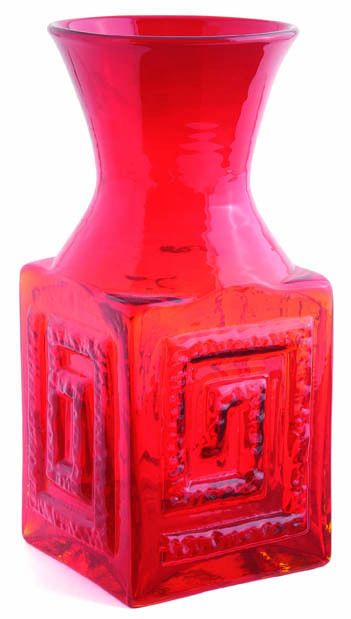 Prices for Whitefriars in general have dropped a little and levelled over the past few years, but at the height of the market, I heard that a possibly unique red example changed hands for over £5,000! The texture and form are also important factors. As the metal moulds were used, they wore down, and the level of texture became lower. Always aim to buy examples with crisp and varied levels of detail as these are much more likely to hold their value. As well as the shape being entirely new, the geometric ‘vortex’ design (echoed in the shape) is also typical of the period, recalling anything from the poster designs of Saul Bass (Vertigo) to avant garde interior décor. Staying with textured mould blown designs that were so typical of this period, Frank Thrower’s FT58 ‘Greek Key’ vase (right) is up next. 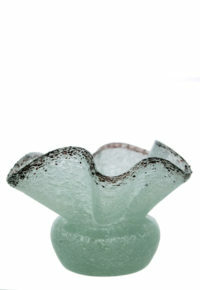 Thrower was a contemporary of Baxter, and both were inspired by modern Scandinavian glass that was being imported into the UK and proving popular at the time. Both also came up with their own versions that put an ‘eccentric’ British spin on Scandinavian principles. Un-flatteringly described as ‘a power station cooling tower on a brick’, this unique design from 1968 is Thrower’s response to Baxter’s iconic ‘Banjo’. Like the ‘Banjo’, it’s all about line and geometry to me – Thrower was a superb draughtsman. A simple rectangle is combined with a neck that is all about circles and curves, and is embellished with another strongly geometric vortex. The same rules about texture apply here but, unlike the ‘Banjo’, this design was produced in three sizes – 9.5in (24cm), 5in (12.5cm) and a squat variation at 3.5in (9cm) high, and numbered FT72. The larger size is scarcer and more valuable, and colour is again important. A ‘Midnight’ grey or colourless example may fetch around £40-60, but if found in the orangey-red ‘Flame’ (shown here) that was only produced until 1970, the price can rise to £300. As a final tip, always examine the corners of the rectangle, as some are very thin and fragile. Thrower was personally inspired by another well-known glassmaker of the 1950s-70s – Ronald Stennett-Willson. It’s his ‘Sheringham’ candleholder design (left) that I’ve selected next. Dating from 1967, it’s clear that something must have been in the air in the late 1960s, judging by the number of classics that were designed then! Scandinavian influences can be seen again, in terms of strong colours and a stark modern form. So, it’s no surprise to learn that Stennett-Willson imported and designed Scandinavian glass before setting up King’s Lynn Glass in 1967. Although it looks like it has been made using a mould, this isn’t the case. Each component was separately made and joined together by the glassmaker, showing enormous virtuosity and skill. 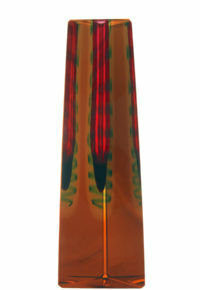 The tallest example shown here, with nine discs, is made up of 21 individual pieces of glass. It’s incredible that they managed to keep them so straight! Discs are key to value, with examples with one or two fetching anything from £10-35, and rare nine disc examples often fetching over £1,000. Made in six sizes and seven colours, orange, blue and (particularly) purple are more desirable than colourless. These were popular as wedding gifts, and as King’s Lynn was successful enough to be sold to Wedgwood only two years after opening, it’s fair to say a fair few were made. For my final two choices of the first five, I’ve selected two glassmakers who I believe were key to the development of the vibrant studio glass market we’re enjoying today. First up is Samuel J. Herman, as none of this would have been possible without his pioneering work. Herman studied glassmaking under the legendary Dominick Labino and Harvey Littleton in the US, and was one of their first students. In 1965, he came to the UK on a scholarship, arriving at Edinburgh College of Art and moving to the Royal College of Art the following year. At both he built a ‘small tank’ furnace that allowed individual glass designers to become makers too, freeing them from the confines of the factory. He then went on to teach glassmaking techniques to what would become the first generation of British studio glassmakers. 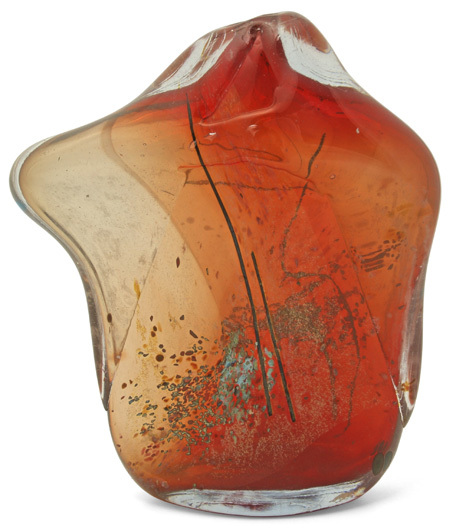 Herman, who is also a sculptor and artist, brought a painterly and sculptural attitude to glassmaking, and can almost be called the ‘Picasso’ of glass. His unique work is typically bright in colour, and abstract in form and pattern. Preparatory paintings or drawing are made first, and Herman uses these as ‘studies’ for the final piece. I could have picked any work from his early period, but this torso vase shows these features well. His work, which is not inexpensive, is almost certainly still under-priced in my opinion and ranges from around £250 to over £5,000. 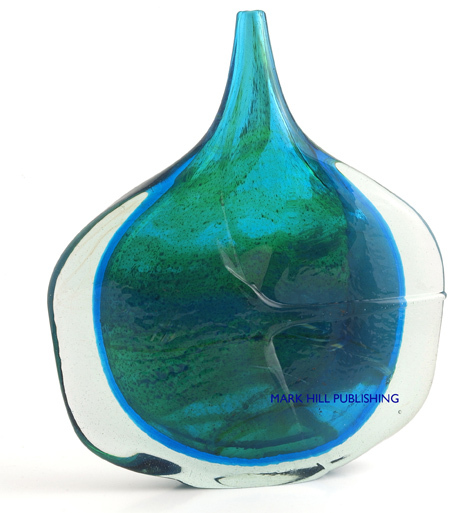 The first to learn from Herman at the RCA was the college’s tutor in glass, Michael Harris. 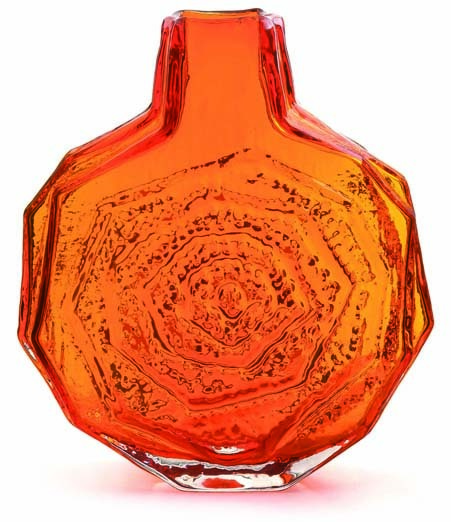 Previously constrained by the fact that he could only produce designs on paper that would then be made by a glassmaker, Harris was bowled over by what Herman had to show him. Combined with his confidence and commercial awareness, months of diligent learning and experimentation equipped him with enough knowledge to found his own studio on Malta in 1968. His most iconic design, and one that only he had enough skill to make during the first few years, was undoubtedly the ‘Fish’ vase. I say vase, but function isn’t the point, as it was intended more as a sculptural work – it’s literally glass as art or sculpture. 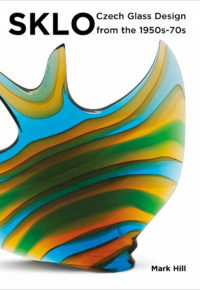 The flattened cased form, with its ‘wings’ that almost give it the form of a manta ray, is derived from early experimental forms in studio glass, but taken to new heights. Complex and time-consuming to make, it is unique and without precedent or antecedent. Those made in Harris’ time (1968-72) have elegantly curved forms, which are quite different from later, more squared-off forms. Values have shot up as these pieces have become more widely appreciated, and you’d be lucky to find one for less than £800 today. 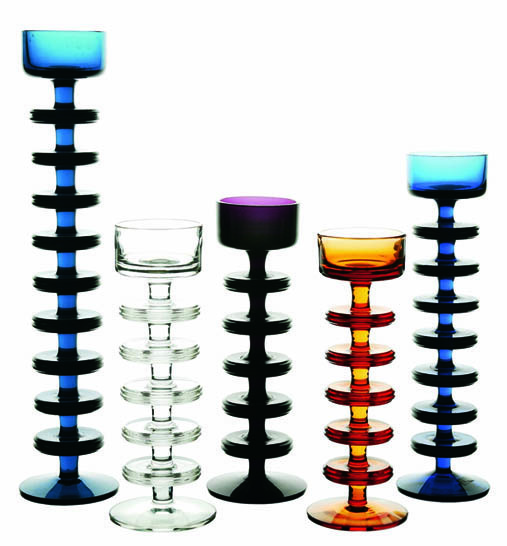 But it’s not just his designs that Harris is known for, as he was also the first to found a commercially and internationally successful business based on studio glassmaking, thus laying important foundations for the future. In the second part of this article, I’ll be moving out of the late 1960s, and indeed the UK, to examine the remaining five of my ‘Top Ten’ in 20th century glass. Click here to read it. Images taken by Graham Rae and Jeremy Martin and courtesy of the Graham Cooley Collection, Mark Hill Publishing Ltd, and Miller’s.